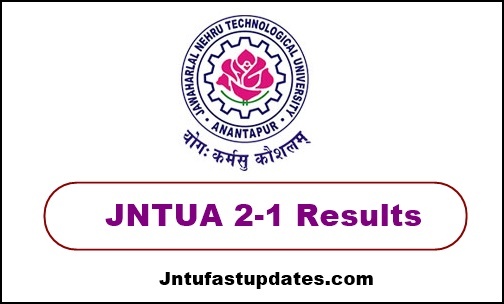 JNTUA 2-1 Results 2018-19: JNTUA B.Tech 2-1 Sem (R15,R13, R09) Regular/Supply Exam Results Nov/Dec 2018 declared at jntuaresults.ac.in. Students can check their jntua 2-1 r15, r13, r09 results 2019 from links given below. jntu anantapur results of II Year I sem: JNTU anantapur has announced B.Tech 2-1 sem R15, R13, R09 Regular/Supply Exam Results November/December 2018. Students can their results from jntua official result portal. The results of following B.Tech 2-1 Semester Regular/Supplementary Examination Results Nov/Dec 2018 are announced. The results are available in the University Examinations Results Portal at jntuaresults.ac.in and jntuaresults.azurewebsites.net. We are providing the step by step procedure to download your results. Here also provide you the information regarding the regular and supplementary examination results available status. How to Get JNTUA 2-1 Regular/Supply Results 2018? Your results will be displayed on the screen. Download & Take the printout for future reference. Sir please release 2-1results sir we are waiting …………please ……..
Students ni intha la wait cheypiste meku antha happiness aaaaa…….